Sad? You can use HULU like CALGON and tell it to take you away! You don’t even have to sign up or pay a dime, HULU has got plenty of freebies to enjoy. Take 2013’s COTTAGE COUNTRY for example. 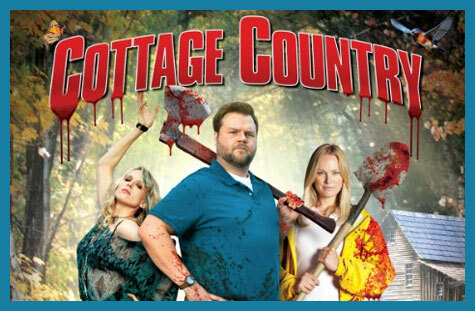 It features saucy and sensational FINAL GIRLS star MALIN AKERMAN and the lovely and glamorous TYLER LABINE of TUCKER AND DALE vs EVIL fame! Both those guys are hilarious if you ask me. I know comedy is subjective so I can’t guarantee you anything but what have you got to lose? This flick is about a couple who try to have a nice weekend but end up killing a bunch of folks instead. You know how that is. It kind of reminds me a bit of another beloved film, 1996’s THE LAST SUPPER. It’s got a similar sick sense of humor plus both films take place in a cozy location that is comfortable to hang out in anyway. Just press this word HERE and away you go!